They are yellow/brown in colour with dark markings on their body, legs and cheeks. They have a pale coloured underside and their striped tail has a black tip. They have a stocky build and relatively short legs. 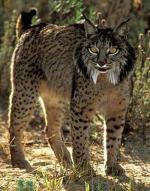 They are mainly active at night and they lead a solitary lifestyle. Chinese Mountain Cats are endemic to China and they can be found in steppe, sparsely-wooded forests, shrublands, desert and mountain habitats in China at altitudes up to 4,000 m (13,120 ft). 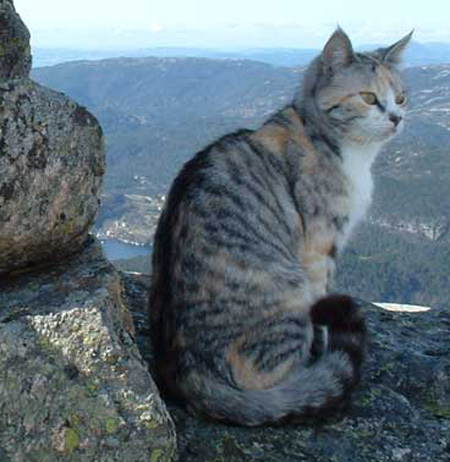 Chinese Mountain Cats mainly feed on pikas and rodents, but they will also prey upon birds. Chinese Mountain Cats breed between January and March and they produce litters of 2 - 4 kittens, usually in May. The youngsters become independent at 7 - 8 months old. 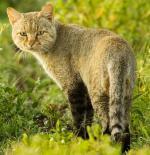 Although Chinese Mountain Cats are protected in China, they are under threat due to the controlled poisoning of pikas. This either reduces their food source or unintentionally poisons the cat. There are no subspecies of the Chinese Mountain Cat.